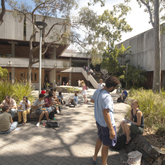 The Auchmuty Library is located on the Western side of the campus near the Shortland Union Building. The Library service zone, Learning Lounge and the Law collection are located on the main level (level 3). The Information Common (AIC), Course Readings collection, Cafe and Cultural Collections are located on level 2. The Learning Lounge is open 24 hours and provides group study spaces, collaborative computer desks, WiFi and a Survival station with food preparation area. Library staff are not available to provide assistance outside library hours. The area is designed for collaborative study. Bring your own device (BYOD) is recommended as individual computer spaces are limited. Laptops are available for loan from the Auchmuty Information Commons. Swipe card access is required for entry outside Library opening hours. The AIC is open 24 hours and provides access to scholarly information and resources in a relaxed, individual or group workspace. This area also includes a Survival station with food preparation area. Wireless and laptop facilities, access to PCs and Macs, scanners, print/copy and laptop borrowing are available. Rovers assist with basic IT support. The Information Service Desk, newspapers and a café are also located in the AIC. Staffing times vary. Swipe card access is required for entry outside Library opening hours.